Hyperbilirubinemia is the medical term for a high bilirubin level in the bloodstream and the cause of jaundice. A newborn with jaundice will have skin that looks yellow and a yellowish look to the white part of the eyes. There are actually four kinds of jaundice that can affect newborns, but none of them are related to vitamin D.
A red blood cell has a lifespan of 120 days; the cell is programmed to die at that time to keep a balance with the number of new blood cells that are being created, explains Roberta Gottlieb, M.D., of San Diego State University in "Williams Hematology." Some of the contents of the dying cell are recyclable. Thus, the hemoglobin is changed to biliverdin and then bilirubin, which is attached to a protein, transported to the liver and changed once more so it can be removed in the urine or stool. A high bilirubin level in the blood causes jaundice. A newborn baby could have breast milk jaundice, breast-feeding jaundice, physiologic jaundice or pathologic jaundice, according to Nicholas Jospe, M.D., professor of pediatrics at the University of Rochester School of Medicine and Dentistry in "The Merck Manual for Healthcare Professionals." In breast milk jaundice, a substance in the milk interferes with bilirubin being changed so it can be eliminated. Some babies develop breast-feeding jaundice if they do not get enough milk. Almost all newborns have physiologic jaundice, but some type of medical disorder causes pathologic jaundice. Neither a vitamin D deficiency nor too much vitamin D causes jaundice. 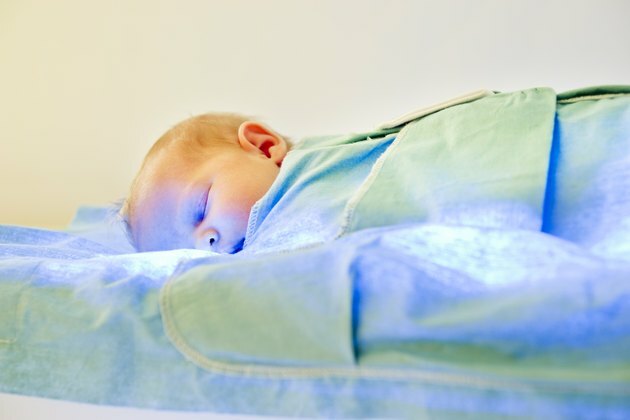 Several factors combined cause physiologic jaundice, explains Elizabeth Thilo, M.D., associate professor in the Department of Pediatrics at the University of Colorado School of Medicine in "Current Diagnosis & Treatment: Pediatrics." Neonatal red blood cells last 90 days, resulting in more bilirubin; a new liver cannot handle this workload; there are no bacteria in the intestines to metabolize bilirubin for elimination in the stool; and the new intestines slowly move. Newborns with pathologic jaundice have red blood cells being destroyed or a disorder that prevents the bilirubin from changing fast enough so it can be excreted. There is no involvement of vitamin D.
A deficiency in vitamin D can lead to rickets; this is a medical disorder of infants and children where the bones are weak and soft. Calcium is required for strong bones, and vitamin D makes sure the intestines absorb enough calcium. However, the active form of vitamin D is naturally made when the ultraviolet rays of the sun reach the skin. In the March 2011 issue of "Pediatrics," Sophie Balk, M.D., writes that the American Academy of Pediatrics recommends a lifelong protection against the rays of the sun to prevent the development of skin cancer, but the academy also recommends that infants and children take vitamin D supplements to avoid getting rickets. An excess of vitamin D can lead to a high blood calcium level, not jaundice. Is it Normal to Have Acid Reflux After Taking a Vitimin B Complex?